SHOOT would like to wish Suleyman Ali “Sulley” Muntari many happy returns as the footballer celebrates his 34th birthday this evening! 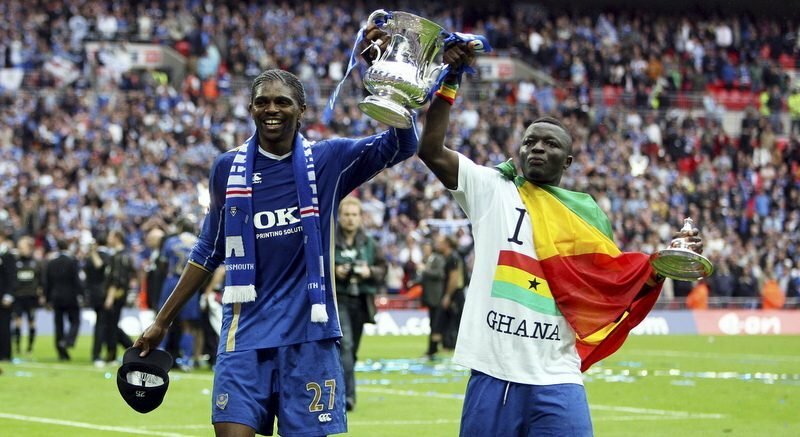 An FA Cup winner with Portsmouth, the former Ghana international midfielder has also played for Udinese, Inter Milan, AC Milan, Sunderland, Al-Ittihad, Pescara and Deportivo de La Coruña during his professional career. After making a name for himself in Italy with Udinese, where he scored nine goals in 152 games in all competitions for the Serie A side, Muntari arrived in England on May 30, 2007, after putting pen to paper on a five-year contract with Pompey. The central midfielder cost Portsmouth a reported club-record £7m, following five seasons at Udinese. Muntari became an integral part of Harry Redknapp’s side during the 2007-08 season, scoring four goals and providing four assists in 29 Premier League appearances for Pompey, as the south coast outfit finished eighth in the English top-flight division. Cardiff City’s Roger Johnson in action against Portsmouth’s Sulley Muntari in the 2008 FA Cup final. 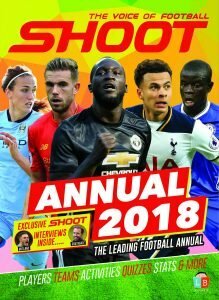 A standout moment for the Ghanaian at Portsmouth came away at Villa Park, when Muntari struck two spectacular long-range goals against Aston Villa in a 3-1 away victory. Despite missing the club’s FA Cup third and fourth round ties against Ipswich Town and Plymouth Argyle respectively, the midfielder started the remainder of Pompey’s cup games en route to Wembley Stadium. He scored the winning goal from the penalty spot during Portsmouth’s 1-0 quarter-final win at Old Trafford, knocking out Sir Alex Ferguson’s Manchester United. Muntari also started the final against Cardiff City at Wembley, where Nwankwo Kanu scored the only goal of the game in the 37th minute. That was the Ghanaian’s first piece of silverware in his professional career. And, it turned out to be his last in English football, as after one whirlwind campaign in the Premier League and FA Cup with Pompey, Muntari joined Italian giants Inter Milan on July 28, 2008. At the San Siro, the ex-Pompey star netted eight goals in 97 matches in all competitions for the Serie A outfit, and he went on to win a handful of honours. Muntari lifted two Serie A titles, two Coppa Italias, two Supercoppa Italianas, the FIFA Club World Cup and the UEFA Champions League in 2010, after defeating Bayern Munich 2-0 in Madrid, with the midfielder substituted on for the final 11 minutes. Muntari lifting the UEFA Champions League trophy with Inter Milan. But in January 2011, Muntari was loaned out by Inter, agreeing a temporary move back to England, joining Sunderland on loan for the remainder of the 2010-11 campaign. 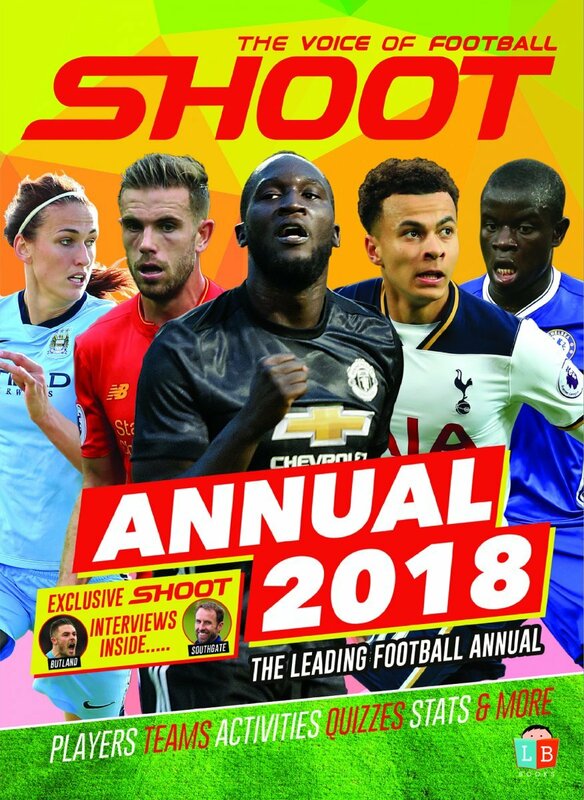 He played just nine games for The Black Cats, before Sunderland opted against signing the Ghana international on a permanent deal in the summer. From there, Muntari joined Inter’s rivals AC Milan in 2012, initially on loan before securing a permanent switch, scoring 13 goals in 83 games overall for The Rossoneri. The Ghanaian was released in June 2015, before agreeing a two-year deal with Saudi side Al-Ittihad the following month. After signing a contract worth a reported €6m, Muntari scored just three goals in 29 games for the club. He returned to Italy in January 2017, signing a six-month contract with Serie A side Pescara, where he found the back of the net once in nine outings. On April 30, 2017, the midfielder walked off the pitch in protest after claiming he was racially abused during Pescara’s 1-0 loss at Cagliari. 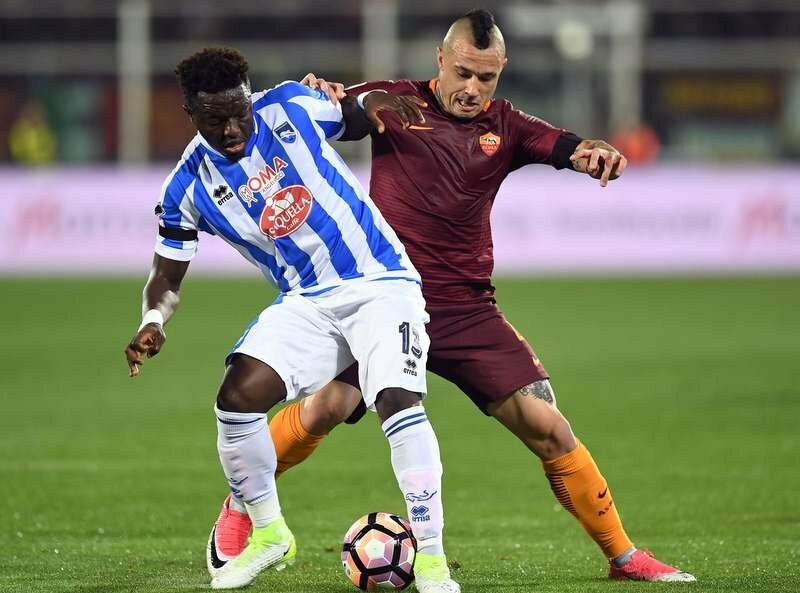 Sulley Muntari in action for Pescara against and AS Roma’s Radja Nainggolan. Muntari complained to the referee, but he received a yellow card for dissent. He then left the football pitch, leaving his side with 10-men for the final few minutes of the game. Most recently, Muntari featured for La Liga outfit Deportivo de La Coruña in the Spanish top-flight, after agreeing a deal until the end of the previous 2017-18 season in February this year. But after eight appearances, his stay at the Estadio Municipal de Riazor was not extended and he was released upon the expiry of his contract in June, and the player is still a free agent now. However, Muntari has been training with Hearts of Oak, a professional football club back in his homeland, although the 34-year-old midfielder, who has 84 international caps and represented his country at three FIFA World Cup finals (2006, 2010, 2014), has admitted he would like to finish his career at Ghana Premier League side Asante Kotoko. Regarded as a Portsmouth hero by many following his successful time at Fratton Park during their memorable 2007-08 season, Muntari is still aiming to prolong his career for as long as possible in the ‘Beautiful Game’. Ghana’s Sulley Muntari facing Italy at the 2006 FIFA World Cup.